A very effective management product that quickly sanitizes and dries navel cords on newborn animals which drastically reduces the risk of infection via the navel. Those that have used iodine in the past will appreciate the arrival of an equivalent alternative. For newborn lambs and goat kids to sanitize and dry navel cords. For use on cattle, sheep, horses, dogs and swine to disinfect superficial wounds, cuts, abrasions, insect bites and minor bruises. 16 oz bottle with sprayer. Ingredients: 7% active ingredients provided by Iodine, Potassium Iodide and Povidone Iodine. If necessary, clip hair from area to be treated and cleanse with soap and water. Apply Triodine-7 with a swab. 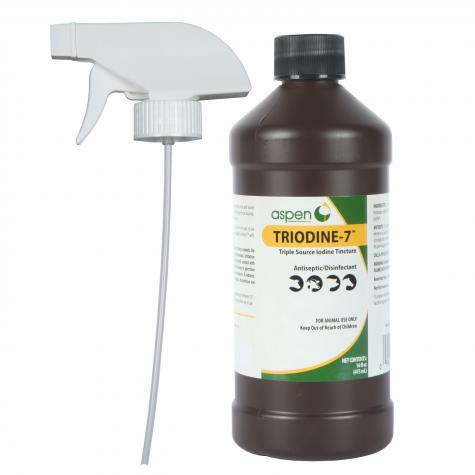 Fill navel cup with Triodine-7. 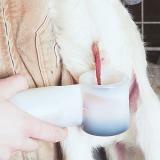 Apply navel cup and coat navel with Triodine-7. Remove navel cup and allow navel to dry. Not for use in body cavities or deep wounds. Do not use on burns. Do not apply under bandage. Irritation may occur if used on tender skin areas. Avoid contact with eyes and mucous membranes. In case of deep or puncture wounds or serious burns, consult a veterinarian. If redness, irritation or swelling persists or increases, discontinue use and consult a veterinarian. Read all warnings and cautions on label. For animal use only. 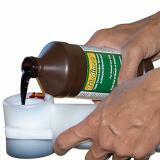 To prevent navel infection in newborns in lambing sheds. 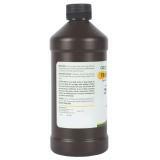 Alternative to iodine to close off the navel cords of newborn lambs and goat kids to prevent entry of organisms. Cover newborn lambs & goat kids with these fitted blankets to provide warmth and protection from the elements.